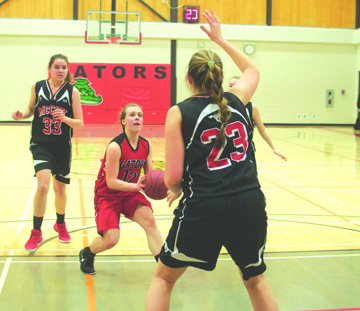 Senator Gershaw Gator's player Jessikah Babe has eyes on the hoop during tournament play on Feb. 23. The number 10 provincially ranked Senator Gershaw Gators senior girls basketball team opened up their home tournament with a 54-40 win over the Monsignor McCoy Colts junior varsity team on Feb. 23, starting an undefeated streak on route to be crowned tournament champions by Saturday afternoon. The girls also beat Vauxhall 68-51 and annihilated Coalhurst 70-21on the road to victory. “Our girls worked really hard and today (vs. McCoy). We played really hard defence, which helped as we stopped them and get some offensive chances,” said Gators assistant coach Barry Smith. He added that strong passing and teamwork allowed the girls to trust each other on the court and play really well. “I think we started a little slow,” said guard Megan Jonker. She said the girls did not let McCoy get any second-chance opportunities on offence and her teammates got the ball up the court real fast where the players can set up and move the ball around. Having a tournament this late in the year has paid dividends heading down the stretch. “The week off, if you don’t do any running anything, you’ll lose a lot of your stamina and all the stuff you’ve worked for,” she said. The girls will be in the playoffs this week where they will be facing Milk River with a shot at making the final against Foremost. Zones will be the following week where the Gators are number four ranked behind the above mentioned teams and Stirling.